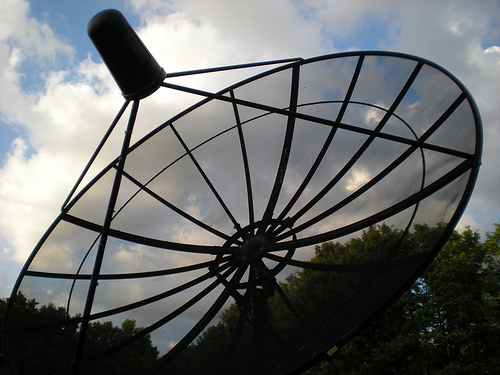 Service Costs > How Much Does Satellite Internet Cost? Satellite internet is internet access provided through a satellite, just like the way you receive satellite television. This service is often provided to those who live in rural areas and aren’t able to connect to a high-speed Internet line. On average, satellite internet is going to range anywhere from $40 to $135 per month depending on the download speeds, bandwidth and the company you choose. Refer to our table below to see what popular satellite Internet companies charge. Speeds on the lower end, around 1 Mbps, are going to be around the $40 to $55 per month, while a higher speed, such as 15 Mbps, can be upwards of $70 to $110 per month. For example, HughesNet.com offers three levels of internet packages. Their monthly fee ranges from $40 to $90 for internet service with speeds from 1 to 2 Mbps. DirectTV also offers 512 Kbps to 2 Mbps satellite internet service with prices ranging from $40 to $70. Most satellite Internet companies will offer speeds between five to 12 Mbps. Typically, if the speeds are faster than five Mbps, you should start to notice a difference when compared to a dial-up modem. At 10 Mbps, this would be close to 175 times faster than dial-up. Data allowance, like the speeds, will depend on the carrier. Data allowance, similar to a phone, caps you at a certain bandwidth amount. Once you hit this target, you will either be charged per gigabyte or the access will be cut off, depending on your preferences. Most companies will limit data to five to 100 gigabytes. While these limits don’t affect the average user, it could be a problem for those who watch a lot of Netflix or download movies. To put it in perspective, five gigabytes is equivalent to a two-hour movie in HD or listening to 90 hours of music. Satellite Internet companies work with all 50 states. If you are a new customer, many companies will provide free installation; however, they may have certain restrictions, such as how many television they can hook up or where they can install your hookups. Typically, with a free installation, a technician will install and mount the satellite dish, run the cable hardware into your home and hook up a modem. Most companies will offer a 90-day warranty on their installation and products. Some companies may require that you rent their modem. This modem can cost anywhere from $5 to $15 per month. Other companies may offer you the option of purchasing a modem or you can do it on your own. Usually, if you go this route, it should cost $150 to $350. For example, at the time of this writing, HughesNet offers the option of purchasing the equipment up front for $299, but if you lease, it will be $10 per month. Comparing the costs with other satellite Internet companies, the $10 per month seems to be the going rate when leasing equipment. Activation fees may apply with some companies and can range anywhere from $10 to more than $150. Early termination fees, if you were to cancel early, could apply, just like satellite TV. If you were to cancel early, you would be responsible for most of the months left on your contract. Satellite Internet works just like DSL and cable connections. If you wanted to hook up more than one computer, a separate router would be required. Most plans will require a 24-month commitment and will require you sign a contract. As stated in the “extra costs” section, if you were to cancel early, you would more than likely have to pay an early termination fee. Just like satellite TV, bad weather can affect your Internet access since the dish needs a clear view of the sky. Can you play games on satellite internet? According to Talia, the only games suitable for satellite internet are the strategy or role-playing games. It’s best to avoid any shooting or sports games due to the latency you may experience from the satellite. Satellite Internet will always be one of the worst values for Internet access. Unless you have no other high-speed Internet options, then it’s best to compare at least three providers before making a decision. Most companies, such as DirecTV and Dish, offer package deals to those who combine their Internet with other services such as cable TV. See if it’s worth buying a package to bring the costs down.